Two cookies in one week?! I KNOW! *sorry not sorry* It is October after all and I haven’t posted a pumpkin recipe yet. That needed to be rectified ASAP. 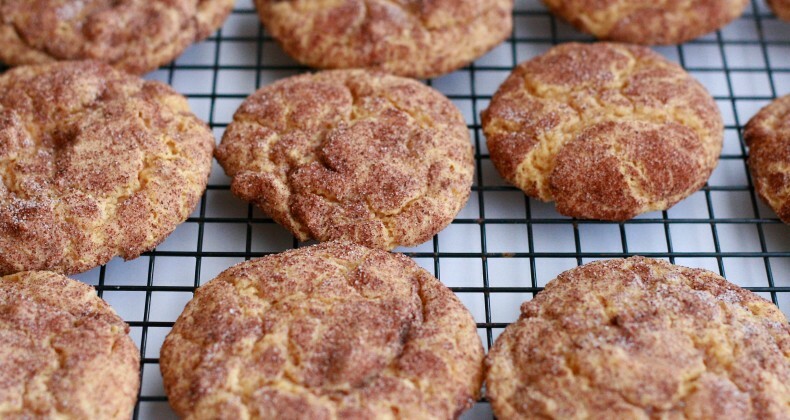 Here we are with a pumpkin cookie rolled in the perfect fall spices. Cinnamon, cloves, and nutmeg. This week I baked dozens and dozens and dozens of cookies. Like a crazy amount of butter and flour were used in my kitchen this week. I had a bake sale at school AND parent teacher conference treats I needed to make. Of course I baked up a couple batches of the Salted Caramel Oatmeal Cookies and my favorite M&M Chocolate Chip Cookies but I wanted to add a new cookie to the mix and the pumpkin snickerdoodles seemed like a great idea. Since I was pretty busy I didn’t have enough time to test and retest and retest a cookie recipe from scratch. While I love creating my own recipes I just needed some help from an established recipe. I checked one of my favorite kitchen resources The Kitchn and found a good sounding recipe. My only change was adding 1/4 teaspoon of cloves to the sugar mixture. Tell me are you a pumpkin spiced whatever fan? Heat over to 325 degrees F. Line a baking sheet with parchment or a Silpat. So true! These are a great match for each other. 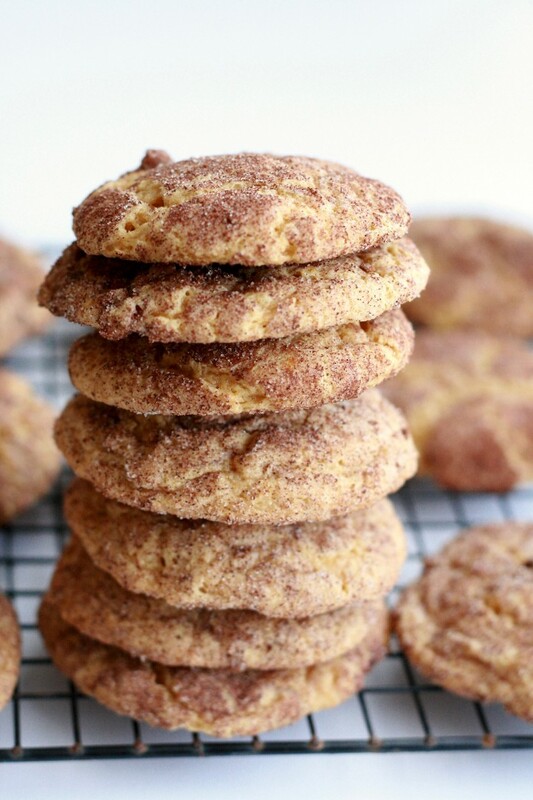 I never thought about doing pumpkin with snickerdoodle- I bet it tastes great. Thanks for the idea! We harvested about 3 dozen butternut squash from our garden. I bet this would work well with those, too. I am certain that would work well. What a great idea to use up some of the garden stash. Cookies recipes are always welcomed!!! Salt caramel cookies are my favorite!!! Haha. The salted caramel ones are soooo good. Yay cookies! Don’t be sorry. Cookies every week! 🙂 Yes, definitely can’t let October go by without a pumpkin recipe. This is great. YUMMMMMMM…I HAVE to make some pumpkin recipes before it’s winter…I have stockpiled them and need to make them. I am also guilty of stockpiling recipes 😉 Hope you enjoy Kim! Yum! These cookies sound delicious. Thank you Brittany they are perfect for Fall. My kiddos loved them I hope yours do too! Stop it …wah!! your cookie posts look so amazing and I’m trying out the gluten free lifestyle for awhile…not fair. 🙁 wah!! (yep, that’s me crying over here.) But seriously though, those look amazing! This ended up to be a very sticky wet dough which was nearly impossible to roll. Is that was you intended? It seems like it needed more flour…..
Oh no sorry Melissa! My dough was slightly sticky but not impossible to roll. Maybe add a few tablespoons of flour until you get the consistency you desire.